With C'est La Vie, Mon Cheri (meaning 'That's life, my love') Derek Yee and crew not only took home 6 Hong Kong Film Awards but it also marked the highest grossing movie of the director's career. The careers for Lau Ching Wan and Anita Yuen were seriously kickstarted and the rest is Hong Kong cinema history. There really lies a lot of meaning in the title C'est La Vie, Mon Cheri. There are many themes & messages that should be discussed because of the brilliant way that they're conveyed but also shouldn't because of the possibility of revealing key plot points. It's another romantic drama for those of you not afraid to shed a tear or two. While the best out of this genre have been about more than just the core romance, I can't think of any other movies that have allowed so many other themes to share the spotlight with it. Slowly, writer/director Yee structures a movie that takes its time and even up till relative late in the movie we're not entirely sure of the final outcome. Primarily it's about people with a large part of their being stuck in poverty. People who may not have choosen to live this way but have adjusted themselves to their current situation. In that lies the optimism of C'est La Vie, Mon Cheri, especially in the portrayal of Min's family. They do street performing for a living and don't look at it as a downstep in life (at least not anymore). They do the best out of the situation they're in and don't really look forward. The outsider, Kit, in a way represents hope for Min even though it is him that is depressed. Min is almost the total opposite because of her constant upbeat mood and looking at her befriending Kit made me think of a possible double agenda on her part. The most obvious is that she's looking after and caring for a troubled soul but deep inside she is probably someone looking for love, like we all do. While the movie does take a romantic turn, it's really about two people trying to seize their opportunity to do something with their lives, if life will allow that. These ingredients in the story are quite easy to pick up on but the amazing thing is that you don't really have to. You can lean back and casually enjoy a good romantic story unlike this poor thinking reviewer. Derek Yee often fills his movies with either obvious or subtle messages and they are there to enjoy, disagree with or enhance the experience a bit more. C'est La Vie, Mon Cheri is really top class filmmaking even if you don't bother deciphering all that is going on underneath the surface. I think it was and still is harder be original in directing if you're striving for that. Directors like Derek Chiu and Wilson Yip knows how and when to inject the little odd, quirky or humorous touches to elevate their stories but with Yee I've noticed more how focused he is in telling a story. Even in an 'ordinary' romance you still have to, to achieve some form of magic, really nail those story beats. You have to think in editing and there are several moments in here where the purpose of each scene is so perfectly executed. Even if it's simple things storywise there's no room for sloppiness. The casting choices are really admirable as well. As I mentioned, Lau Ching Wan and Anita Yuen really broke through with this movie. It's also amazing that it did so well at the box office. Whether it was because word of mouth spread about a good romance I don't know but the recognizable faces were in the supporting cast, not in the leading players. Paul Chun is a familiar face not only for fans of Derek Yee but also through movies like Hong Kong 1941 and Fist Of Legend. He certainly is among the top characterplayers of his generation and even if he's not much in this one, he brings such realism and sense of truly belonging to the father part. Playing the mother is Fung Bo Bo (sister of famed Hong Kong cinema bad guy Fung Hark On). She was very active in 60s Hong Kong cinema and somewhat of an action queen, even though she played male roles like Fong Sai Yuk in the old black & white films. Her character here seems somewhat stuck in her thinking but responds and opens up to the genuine care for Min that Kit shows. The weak actress here could've been Carrie Ng (Naked Killer) but her performance just goes to show that under the direction of someone like Derek, anyone can do a good job. The newcomers gets the responsibility of carrying C'est La Vie, Mon Cheri. They're in most scenes and they don't disappoint in any of them. It's hard for us to look back and see the revelation of a great movie actor in Lau Ching Wan like the Hong Kong audience did. We already know what an accomplished actor he is and seeing this great 1993 movie feels no different than a great 1997 movie from Lau. In my opinion, he already had the skill. The script requires him to go from down to up with some real emotions in between and did I ever doubt he wouldn't succeed? No, and apparently Derek Yee did not either. Today Lau Ching Wan's contribution to this film stands as one of his most memorable and he's continued on to build himself quite a career. 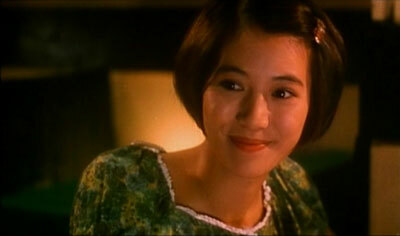 Anita Yuen. I don't know where my preconceived notions of her came from. For a while I had the impression of a way too cutesy and annoying screenpersona, an impression that got erased when I saw her dark turn in Till Death Do Us Part. That was far from the bright side that I thought I disliked and thank god C'est La Vie, Mon Cheri came along. She's amazing playing Min, the girl who is never short on words or positive energy. A character like that may be annoying to some people but Kit is really taken by that and he also becomes part of the people on life's positive side. Like her male counterpart she too is required to go through a series of emotions and I found no real flaw in her doing of that. In fact, it's hard to find any bad casting choices in this movie. In Derek Yee's created world there's both pessimism and optimism and there's no doubt that both moods make up something I dare call a masterpiece. Watch it to experience more depth than you find in your usual movie romance. Witness another level of versatility in Derek Yee's awesome filmography and watch it for the perfectly executed closing shot that truly captures the meaning of the words C'est La Vie, Mon Cheri. This is the remastered Universe release (I got the old cover though) but I have to say that the transfer is quite disappointing. Colours and sharpness are pretty acceptable but there shifts in colour timing between scenes at times. The worst thing is the constant print damage. It's mostly fairly light speckling but annoying considering the quality of Universe's previous Derek Yee releases. The Cantonese 2.0 track does its job and no real front speaker separation was noticed by me. It sounds a little harsh and muffled but ultimately works for the movie. A Mandarin 2.0 dub is also included. Worth noting is that the movie was shot sync sound Cantonese, something that was not seen in all movies around that time in Hong Kong. The English subtitles are pretty good however. 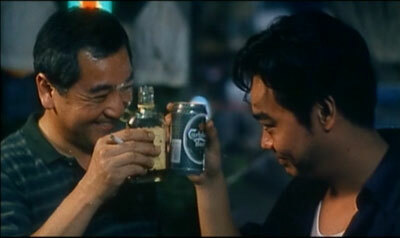 Very few spelling errors and the only drawback is that the written words after the final scene are not translated. This review provides that though (at the bottom) but don't read them until after seeing the movie. Traditional and simplified Chinese subtitles are also included. Only extras are one single Star File for Lau Ching Wan and the trailer for I Have A Date With Spring.